Originally published under the title, "Muslim Teacher Loses Claim School Violated His Free Speech Rights and Discriminated Against His Religion." 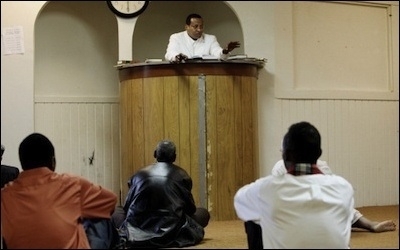 Abdurahman Haji preaches at a local mosque in 2011. On July 16, 2015, the federal Sixth Circuit Court of Appeals rejected a wrongful termination suit against the Columbus City Schools by a Muslim teacher claiming retaliation for some religiously motivated comments and actions. The suit was brought by Abdurahman Haji, an elder in the Somali community of Columbus, Ohio. Haji was hired in November 2005, to teach English as a Second Language at a public school, and discharged in April 2008. Briefly, Haji's practice was to leave school early every Friday in order to lead prayers at his mosque. On his departure, he would not sign out from school. Usually, he would return to school after services, but if they ran long he would not return. In 2007, Haji gave a lecture at his mosque in which he identified himself as a school employee and expressed "concern that the school was exposing Muslim students to the polytheistic belief system of Greek mythology." The video was uploaded to YouTube, and school officials learned of it from a student who told them Haji was "saying bad things about the school." Haji also complained to parents because female Somali students were not covering and were filmed dancing, and because he had observed a teacher (presumably male, although the opinion does not say) hugging a female Somali student "in a manner that he deemed inappropriate for a Muslim girl." Haji was suspended for a day for insubordination. Around this time, school officials began to complain that Haji's early departures were interfering with his job. Haji was told he could no longer leave early without obtaining prior permission. He ignored this requirement and was fired. Haji filed a wrongful discharge suit claiming violations of his First Amendment rights (protected by Section 1983 of Title 42), Title VII, and Ohio state law. The lower court granted summary judgment in favor of the school and dismissed Haji's claims. He appealed. Last Thursday, the appellate court issued an unpublished opinion upholding the decision of the trial court. Basically, the court said that even if the school were retaliating for Haji's comments, that's ok because it had legitimate grounds to fire him, namely his failure to comply with the attendance policy. That was true even though the school had not enforced its policy before Haji made his comments. Haji's claim of religious bias under Title VII also failed, because he could not show that non-Muslim critics of the school were treated more favorably than he. The opinion is, as noted, unpublished, which is a device courts often use for opinions on which they spend less time and attention than published opinions, and they often may not be cited as support in later cases.